Graves disease, named after Robert J. Graves, MD,  circa 1830s, is an autoimmune disease characterized by hyperthyroidism due to circulating autoantibodies. Thyroid-stimulating immunoglobulins (TSIs) bind to and activate thyrotropin receptors, causing the thyroid gland to grow and the thyroid follicles to increase synthesis of thyroid hormone. Graves disease, along with Hashimoto thyroiditis, is classified as an autoimmune thyroid disorder. Graves ophthalmopathy is shown below. Graves disease. 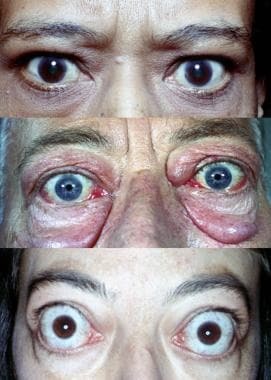 Varying degrees of manifestations of Graves ophthalmopathy. In Graves disease, B and T lymphocyte-mediated autoimmunity are known to be directed at 4 well-known thyroid antigens: thyroglobulin, thyroid peroxidase, sodium-iodide symporter and the thyrotropin receptor. However, the thyrotropin receptor itself is the primary autoantigen of Graves disease and is responsible for the manifestation of hyperthyroidism. In this disease, the antibody and cell-mediated thyroid antigen-specific immune responses are well defined. Direct proof of an autoimmune disorder that is mediated by autoantibodies is the development of hyperthyroidism in healthy subjects by transferring thyrotropin receptor antibodies in serum from patients with Graves disease and the passive transfer of thyrotropin receptor antibodies to the fetus in pregnant women. The thyroid gland is under continuous stimulation by circulating autoantibodies against the thyrotropin receptor, and pituitary thyrotropin secretion is suppressed because of the increased production of thyroid hormones. The stimulating activity of thyrotropin receptor antibodies is found mostly in the immunoglobulin G1 subclass. These thyroid-stimulating antibodies cause release of thyroid hormone and thyroglobulin that is mediated by 3,'5'-cyclic adenosine monophosphate (cyclic AMP), and they also stimulate iodine uptake, protein synthesis, and thyroid gland growth. The anti-sodium-iodide symporter, antithyroglobulin, and antithyroid peroxidase antibodies appear to have little role in the etiology of hyperthyroidism in Graves disease. However, they are markers of autoimmune disease against the thyroid. Intrathyroidal lymphocytic infiltration is the initial histologic abnormality in persons with autoimmune thyroid disease and can be correlated with the titer of thyroid antibodies. Besides being the source of autoantigens, the thyroid cells express molecules that mediate T cell adhesion and complement regulation (Fas and cytokines) that participate and interact with the immune system. In these patients, the proportion of CD4 lymphocytes is lower in the thyroid than in the peripheral blood. The increased Fas expression in intrathyroidal CD4 T lymphocytes may be the cause of CD4 lymphocyte reduction in these individuals. Several autoimmune thyroid disease susceptibility genes have been identified: CD40, CTLA-4, thyroglobulin, TSH receptor, and PTPN22. [3, 4] Some of these susceptibility genes are specific to either Graves disease or Hashimoto thyroiditis, while others confer susceptibility to both conditions. The genetic predisposition to thyroid autoimmunity may interact with environmental factors or events to precipitate the onset of Graves disease. Pathophysiologic mechanisms are shown in the image below. 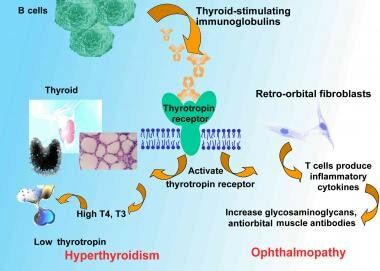 Pathophysiologic mechanisms of Graves disease relating thyroid-stimulating immunoglobulins to hyperthyroidism and ophthalmopathy. T4 is levothyroxine. T3 is triiodothyronine. Graves disease is the most common cause of hyperthyroidism in the United States. A study conducted in Olmstead County, Minnesota estimated the incidence to be approximately 30 cases per 100,000 persons per year. The prevalence of maternal thyrotoxicosis is approximately 1 case per 500 persons, with maternal Graves disease being the most common etiology. Commonly, patients have a family history involving a wide spectrum of autoimmune thyroid diseases, such as Graves disease, Hashimoto thyroiditis, or postpartum thyroiditis, among others. If left untreated, Graves disease can cause severe thyrotoxicosis. A life-threatening thyrotoxic crisis (ie, thyroid storm) can occur. Long-standing severe thyrotoxicosis leads to severe weight loss with catabolism of bone and muscle. Cardiac complications and psychocognitive complications can cause significant morbidity. Graves disease is also associated with ophthalmopathy, dermopathy, and acropachy. Hyperthyroidism increases muscular energy expenditure and muscle protein breakdown. These abnormalities may explain the sarcopenia and myopathy observed in patients with hyperthyroid Graves disease. Nonpitting edema is the most prevalent form of dermopathy (about 40%) and are primarily in the pretibial area. The nearly all (>95%) patients with dermopathy had ophthalmopathy. Advanced forms of dermopathy are elephantiasis or thyroid acropachy. Severe acropachy can be disabling and can lead to total loss of hand function. Progression of ophthalmopathy can lead to compromised vision and blindness. Visual loss due to corneal lesions or optic nerve compression can be seen in severe Graves ophthalmopathy. Maternal Graves disease can lead to neonatal hyperthyroidism by transplacental transfer of thyroid-stimulating antibodies. Approximately 1-5% of children of mothers with Graves disease (usually with high TSI titer) are affected. Usually, the TSI titer falls during pregnancy. Elderly individuals may develop apathetic hyperthyroidism, and the only presenting features may be unexplained weight loss or cardiac symptoms such as atrial fibrillation and congestive heart failure. In whites, autoimmune thyroid diseases are, based on linkage analysis, linked with the following loci: AITD1, CTLA4, GD1, GD2, GD3, HT1, and HT2. Different loci have been reported to be linked with autoimmune thyroid diseases in persons of other races. Susceptibility is influenced by genes in the human leukocyte antigen (HLA) region on chromosome 6 and in CTLA4 on band 2q33. Association with specific HLA haplotypes has been observed and is found to vary with ethnicity. As with most autoimmune diseases, susceptibility is increased in females. Hyperthyroidism due to Graves disease has a female-to-male ratio of 7-8:1. The female-to-male ratio for pretibial myxedema is 3.5:1. Only 7% of patients with localized myxedema have thyroid acropachy. Unlike the other manifestations of Graves disease, the female-to-male ratio for thyroid acropachy is 1:1. Typically, Graves disease is a disease of young women, but it may occur in persons of any age. The typical age range is 20-40 years. Most affected women are aged 30-60 years. The natural history of Graves disease is that most patients become hypothyroid and require replacement. Similarly, the ophthalmopathy generally becomes quiescent. On occasion, hyperthyroidism returns because of persisting thyroid tissue after ablation and high antibody titers of anti-TSI. Further therapy may be necessary in the form of surgery or radioactive iodine ablation. Awareness of the symptoms related to hyperthyroidism and hypothyroidism is important, especially in the titration of antithyroid agents and in replacement therapy for hypothyroidism. Patients also should be aware of the potential adverse effects of these medicines. They should watch for fever, sore throat, and throat ulcers. Patients also must be instructed to avoid cold medicines that contain alpha-adrenergic agonists such as ephedrine or pseudoephedrine. For patient education resources, see the Endocrine System Center, as well as Thyroid Problems. Ellis H. Robert Graves: 1796-1852. Br J Hosp Med (Lond). 2006 Jun. 67(6):313. [Medline]. Cruz AA, Akaishi PM, Vargas MA, de Paula SA. Association between thyroid autoimmune dysfunction and non-thyroid autoimmune diseases. Ophthal Plast Reconstr Surg. 2007 Mar-Apr. 23(2):104-8. [Medline]. Jacobson EM, Tomer Y. The CD40, CTLA-4, thyroglobulin, TSH receptor, and PTPN22 gene quintet and its contribution to thyroid autoimmunity: back to the future. J Autoimmun. 2007 Mar-May. 28(2-3):85-98. [Medline]. Iwama S, Ikezaki A, Kikuoka N, et al. Association of HLA-DR, -DQ genotype and CTLA-4 gene polymorphism with Graves' disease in Japanese children. Horm Res. 2005. 63(2):55-60. [Medline]. Chu X, Pan CM, Zhao SX, et al. A genome-wide association study identifies two new risk loci for Graves' disease. Nat Genet. 2011 Aug 14. 43(9):897-901. [Medline]. Bell L, Hunter AL, Kyriacou A, Mukherjee A, Syed AA. Clinical diagnosis of Graves' or non-Graves' hyperthyroidism compared to TSH receptor antibody test. Endocr Connect. 2018 Mar 12. 2017:7354673. [Medline]. [Full Text]. Douglas RS, Afifiyan NF, Hwang CJ, et al. Increased generation of fibrocytes in thyroid-associated ophthalmopathy. J Clin Endocrinol Metab. 2010 Jan. 95(1):430-8. [Medline]. [Full Text]. Chu X, Pan CM, Zhao SX, Liang J, Gao GQ, Zhang XM, et al. A genome-wide association study identifies two new risk loci for Graves' disease. Nat Genet. 2011 Aug 14. 43(9):897-901. [Medline]. Furszyfer J, Kurland LT, McConahey WM, Elveback LR. Graves' disease in Olmsted County, Minnesota, 1935 through 1967. Mayo Clin Proc. 1970 Sep. 45(9):636-44. [Medline]. Tunbridge WM, Evered DC, Hall R, et al. The spectrum of thyroid disease in a community: the Whickham survey. Clin Endocrinol (Oxf). 1977 Dec. 7(6):481-93. [Medline]. Vanderpump MP, Tunbridge WM, French JM, et al. The incidence of thyroid disorders in the community: a twenty-year follow-up of the Whickham Survey. Clin Endocrinol (Oxf). 1995 Jul. 43(1):55-68. [Medline]. Riis AL, Jørgensen JO, Gjedde S, et al. Whole body and forearm substrate metabolism in hyperthyroidism: evidence of increased basal muscle protein breakdown. Am J Physiol Endocrinol Metab. 2005 Jun. 288(6):E1067-73. [Medline]. Nayak B, Burman K. Thyrotoxicosis and thyroid storm. Endocrinol Metab Clin North Am. 2006 Dec. 35(4):663-86, vii. [Medline]. Burch HB, Wartofsky L. Life-threatening thyrotoxicosis. Thyroid storm. Endocrinol Metab Clin North Am. 1993 Jun. 22(2):263-77. [Medline]. Park SE, Cho MA, Kim SH, Rhee Y, Kang ES, Ahn CW. The adaptation and relationship of FGF-23 to changes in mineral metabolism in Graves' disease. Clin Endocrinol (Oxf). 2007 Jun. 66(6):854-8. [Medline]. Uchida T, Takeno K, Goto M, et al. Superior thyroid artery mean peak systolic velocity for the diagnosis of thyrotoxicosis in Japanese patients. Endocr J. 2010 Mar 6. [Medline]. [Full Text]. Bunevicius R, Prange AJ Jr. Psychiatric manifestations of Graves' hyperthyroidism: pathophysiology and treatment options. CNS Drugs. 2006. 20(11):897-909. [Medline]. Vogel A, Elberling TV, Hørding M, Dock J, Rasmussen AK, Feldt-Rasmussen U. Affective symptoms and cognitive functions in the acute phase of Graves' thyrotoxicosis. Psychoneuroendocrinology. 2007 Jan. 32(1):36-43. [Medline]. Schwartz KM, Fatourechi V, Ahmed DD, Pond GR. Dermopathy of Graves' disease (pretibial myxedema): long-term outcome. J Clin Endocrinol Metab. 2002 Feb. 87(2):438-46. [Medline]. Kim JW, Ko J, Woo YJ, Bae HW, Yoon JS. Prevalence of Ocular Hypertension and Glaucoma as well as Associated Factors in Graves' Orbitopathy. J Glaucoma. 2018 Mar 19. [Medline]. Boelaert K, Newby PR, Simmonds MJ, et al. Prevalence and relative risk of other autoimmune diseases in subjects with autoimmune thyroid disease. Am J Med. 2010 Feb. 123(2):183.e1-9. [Medline]. Tun NN, Beckett G, Zammitt NN, Strachan MW, Seckl JR, Gibb FW. Thyrotropin Receptor Antibody Levels at Diagnosis and After Thionamide Course Predict Graves' Disease Relapse. Thyroid. 2016 Jul 6. [Medline]. Rabon S, Burton AM, White PC. Graves' Disease in Children: Long Term Outcomes of Medical Therapy. Clin Endocrinol (Oxf). 2016 May 12. [Medline]. Chen JL, Chiu HW, Tseng YJ, Chu WC. Hyperthyroidism is characterized by both increased sympathetic and decreased vagal modulation of heart rate: evidence from spectral analysis of heart rate variability. Clin Endocrinol (Oxf). 2006 Jun. 64(6):611-6. [Medline]. Kung AW. Clinical review: Thyrotoxic periodic paralysis: a diagnostic challenge. J Clin Endocrinol Metab. 2006 Jul. 91(7):2490-5. [Medline]. Ryan DP, da Silva MR, Soong TW, et al. Mutations in potassium channel Kir2.6 cause susceptibility to thyrotoxic hypokalemic periodic paralysis. Cell. 2010 Jan 8. 140(1):88-98. [Medline]. [Full Text]. Tanda ML, Piantanida E, Liparulo L, Veronesi G, Lai A, Sassi L, et al. Prevalence and Natural History of Graves' Orbitopathy in a Large Series of Patients with Newly Diagnosed Graves' Hyperthyroidism Seen at a Single Center. J Clin Endocrinol Metab. 2013 Feb 13. [Medline]. Chung JO, Cho DH, Chung DJ, et al. Ultrasonographic features of papillary thyroid carcinoma in patients with Graves' disease. Korean J Intern Med. 2010 Mar. 25(1):71-6. [Medline]. [Full Text]. Pellegriti G, Mannarino C, Russo M, Terranova R, Marturano I, Vigneri R. Increased Mortality in Patients with Differentiated Thyroid Cancer Associated With Graves' Disease. J Clin Endocrinol Metab. 2013 Jan 24. [Medline]. Brandt F, Thvilum M, Almind D, Christensen K, Green A, Hegedus L, et al. Graves´ disease and toxic nodular goiter are both associated with increased mortality but differ with respect to the cause of death. A Danish population-based register study. Thyroid. 2012 Dec 20. [Medline]. Zaletel K, Krhin B, Gaberscek S, Pirnat E, Hojker S. The influence of the exon 1 polymorphism of the cytotoxic T lymphocyte antigen 4 gene on thyroid antibody production in patients with newly diagnosed Graves' disease. Thyroid. 2002 May. 12(5):373-6. [Medline]. Zaletel K, Krhin B, Gaberscek S, Hojker S. Thyroid autoantibody production is influenced by exon 1 and promoter CTLA-4 polymorphisms in patients with Hashimoto's thyroiditis. Int J Immunogenet. 2006 Apr. 33(2):87-91. [Medline]. Wang PW, Chen IY, Liu RT, Hsieh CJ, Hsi E, Juo SH. Cytotoxic T lymphocyte-associated molecule-4 gene polymorphism and hyperthyroid Graves' disease relapse after antithyroid drug withdrawal: a follow-up study. J Clin Endocrinol Metab. 2007 Jul. 92(7):2513-8. [Medline]. Ban Y, Tozaki T, Taniyama M, Tomita M, Ban Y. Association of a C/T single-nucleotide polymorphism in the 5' untranslated region of the CD40 gene with Graves' disease in Japanese. Thyroid. 2006 May. 16(5):443-6. [Medline]. Heward JM, Brand OJ, Barrett JC, Carr-Smith JD, Franklyn JA, Gough SC. Association of PTPN22 haplotypes with Graves' disease. J Clin Endocrinol Metab. 2007 Feb. 92(2):685-90. [Medline]. Minich WB, Dehina N, Welsink T, Schwiebert C, Morgenthaler NG, Köhrle J. Autoantibodies to the IGF1 Receptor in Graves' Orbitopathy. J Clin Endocrinol Metab. 2013 Feb. 98(2):752-60. [Medline]. Benvenga S, Guarneri F, Vaccaro M, et al. Homologies between proteins of Borrelia burgdorferi and thyroid autoantigens. Thyroid. 2004. 14:964-6. [Medline]. Gangi E, Kapatral V, El-Azami El-Idrissi M, et al. Characterization of a recombinant Yersinia enterocolitica lipoprotein; implications for its role in autoimmune response against thyrotropin receptor. Autoimmunity. 2004 Sep-Nov. 37(6-7):515-20. [Medline]. Al-Muqbel KM, Tashtoush RM. Patterns of thyroid radioiodine uptake: Jordanian experience. J Nucl Med Technol. 2010 Mar. 38(1):32-6. [Medline]. De Bellis A, Sansone D, Coronella C, et al. Serum antibodies to collagen XIII: a further good marker of active Graves' ophthalmopathy. Clin Endocrinol (Oxf). 2005 Jan. 62(1):24-9. [Medline]. Cappelli C, Pirola I, De Martino E, Agosti B, Delbarba A, Castellano M. The role of imaging in Graves' disease: A cost-effectiveness analysis. Eur J Radiol. 2007 Apr 23. [Medline]. Markovic V, Eterovic D. Thyroid echogenicity predicts outcome of radioiodine therapy in patients with graves' disease. J Clin Endocrinol Metab. 2007 Sep. 92(9):3547-52. [Medline]. Yasuda K, Miyoshi Y, Tachibana M, et al. Relationship between dose of antithyroid drugs and adverse events in pediatric patients with Graves' disease. Clin Pediatr Endocrinol. 2017 Jan. 26 (1):1-7. [Medline]. [Full Text]. Kubota S, Ohye H, Yano G, Nishihara E, Kudo T, Ito M. Two-day thionamide withdrawal prior to radioiodine uptake sufficiently increases uptake and does not exacerbate hyperthyroidism compared to 7-day withdrawal in Graves' disease. Endocr J. 2006 Oct. 53(5):603-7. [Medline]. Bonnema SJ, Bennedbaek FN, Veje A, et al. Propylthiouracil before 131I therapy of hyperthyroid diseases: effect on cure rate evaluated by a randomized clinical trial. J Clin Endocrinol Metab. 2004. 89:4439-44. [Medline]. Read CH Jr, Tansey MJ, Menda Y. A 36-year retrospective analysis of the efficacy and safety of radioactive iodine in treating young Graves' patients. J Clin Endocrinol Metab. 2004 Sep. 89(9):4229-33. [Medline]. Ceccarelli C, Canale D, Battisti P, Caglieresi C, Moschini C, Fiore E. Testicular function after 131I therapy for hyperthyroidism. Clin Endocrinol (Oxf). 2006 Oct. 65(4):446-52. [Medline]. Rivkees SA, Dinauer C. An optimal treatment for pediatric Graves' disease is radioiodine. J Clin Endocrinol Metab. 2007 Mar. 92(3):797-800. [Medline]. Chen YK, Lin CL, Chang YJ, Cheng FT, Peng CL, Sung FC. Cancer risk in patients with Graves' disease: A nationwide cohort study. Thyroid. 2013 Feb 19. [Medline]. Ye X, Liu J, Wang Y, Bin L, Wang J. Increased serum VEGF and b-FGF in Graves' ophthalmopathy. Graefes Arch Clin Exp Ophthalmol. 2014 Oct. 252 (10):1639-44. [Medline]. Stein JD, Childers D, Gupta S, Talwar N, Nan B, Lee BJ, et al. Risk factors for developing thyroid-associated ophthalmopathy among individuals with Graves disease. JAMA Ophthalmol. 2015 Mar. 133 (3):290-6. [Medline]. Watanabe N, Noh JY, Kozaki A, Iwaku K, Sekiya K, Kosuga Y, et al. Radioiodine-Associated Exacerbation of Graves' Orbitopathy in the Japanese Population: Randomized Prospective Study. J Clin Endocrinol Metab. 2015 Jul. 100 (7):2700-8. [Medline]. Shiber S, Stiebel-Kalish H, Shimon I, Grossman A, Robenshtok E. Glucocorticoid regimens for prevention of Graves' ophthalmopathy progression following radioiodine treatment: systematic review and meta-analysis. Thyroid. 2014 Oct. 24 (10):1515-23. [Medline]. Bartalena L, Marcocci C, Bogazzi F, et al. Relation between therapy for hyperthyroidism and the course of Graves' ophthalmopathy. N Engl J Med. 1998 Jan 8. 338(2):73-8. [Medline]. Bartalena L, Marcocci C, Bogazzi F, Panicucci M, Lepri A, Pinchera A. Use of corticosteroids to prevent progression of Graves' ophthalmopathy after radioiodine therapy for hyperthyroidism. N Engl J Med. 1989 Nov 16. 321(20):1349-52. [Medline]. Bartalena L, Tanda ML, Piantanida E, Lai A, Pinchera A. Relationship between management of hyperthyroidism and course of the ophthalmopathy. J Endocrinol Invest. 2004 Mar. 27(3):288-94. [Medline]. Macchia PE, Bagattini M, Lupoli G, et al. High-dose intravenous corticosteroid therapy for Graves' ophthalmopathy. J Endocrinol Invest. 2001. 24:152-8. [Medline]. Gibson A, Czyz CN. Graves Disease, Orbital Decompression. 2018 Jan. [Medline]. [Full Text]. Sisti E, Coco B, Menconi F, Leo M, Rocchi R, Latrofa F, et al. Intravenous glucocorticoid therapy for Graves' ophthalmopathy and acute liver damage: an epidemiological study. Eur J Endocrinol. 2015 Mar. 172 (3):269-76. [Medline]. Liao SL, Huang SW. Correlation of retrobulbar volume change with resected orbital fat volume and proptosis reduction after fatty decompression for Graves ophthalmopathy. Am J Ophthalmol. 2011 Mar. 151(3):465-9.e1. [Medline]. Wakelkamp IM, Tan H, Saeed P, et al. Orbital irradiation for Graves' ophthalmopathy: Is it safe? A long-term follow-up study. Ophthalmology. 2004 Aug. 111(8):1557-62. [Medline]. Seals KF, Lee EW, Cagnon CH, Al-Hakim RA, Kee ST. Radiation-Induced Cataractogenesis: A Critical Literature Review for the Interventional Radiologist. Cardiovasc Intervent Radiol. 2015 Sep 24. [Medline]. Rajendram R, Bunce C, Lee RW, Morley AM. Orbital radiotherapy for adult thyroid eye disease. Cochrane Database Syst Rev. 2012 Jul 11. 7:CD007114. [Medline]. Dickinson AJ, Vaidya B, Miller M, Coulthard A, Perros P, Baister E. Double-blind, placebo-controlled trial of octreotide long-acting repeatable (LAR) in thyroid-associated ophthalmopathy. J Clin Endocrinol Metab. 2004 Dec. 89(12):5910-5. [Medline]. Wemeau JL, Caron P, Beckers A, et al. Octreotide (long-acting release formulation) treatment in patients with graves' orbitopathy: clinical results of a four-month, randomized, placebo-controlled, double-blind study. J Clin Endocrinol Metab. 2005. 90:841-8. [Medline]. Stan MN, Garrity JA, Bradley EA, Woog JJ, Bahn MM, Brennan MD. Randomized, double-blind, placebo-controlled trial of long-acting release octreotide for treatment of Graves' ophthalmopathy. J Clin Endocrinol Metab. 2006 Dec. 91(12):4817-24. [Medline]. Durrani OM, Reuser TQ, Murray PI. Infliximab: a novel treatment for sight-threatening thyroid associated ophthalmopathy. Orbit. 2005 Jun. 24(2):117-9. [Medline]. Salvi M, Vannucchi G, Campi I, Currò N, Dazzi D, Simonetta S. Treatment of Graves' disease and associated ophthalmopathy with the anti-CD20 monoclonal antibody rituximab: an open study. Eur J Endocrinol. 2007 Jan. 156(1):33-40. [Medline]. Stan MN, Garrity JA, Carranza Leon BG, Prabin T, Bradley EA, Bahn RS. Randomized controlled trial of rituximab in patients with Graves' orbitopathy. J Clin Endocrinol Metab. 2015 Feb. 100 (2):432-41. [Medline]. Salvi M, Vannucchi G, Currò N, Campi I, Covelli D, Dazzi D, et al. Efficacy of B-cell targeted therapy with rituximab in patients with active moderate to severe Graves' orbitopathy: a randomized controlled study. J Clin Endocrinol Metab. 2015 Feb. 100 (2):422-31. [Medline]. Ebner R, Devoto MH, Weil D, et al. Treatment of thyroid associated ophthalmopathy with periocular injections of triamcinolone. Br J Ophthalmol. 2004 Nov. 88(11):1380-6. [Medline]. [Full Text]. Finamor FE, Martins JR, Nakanami D, Paiva ER, Manso PG, Furlanetto RP. Pentoxifylline (PTX)--an alternative treatment in Graves' ophthalmopathy (inactive phase): assessment by a disease specific quality of life questionnaire and by exophthalmometry in a prospective randomized trial. Eur J Ophthalmol. 2004 Jul-Aug. 14(4):277-83. [Medline]. Grodski S, Stalberg P, Robinson BG, Delbridge LW. Surgery versus Radioiodine Therapy as Definitive Management for Graves' Disease: The Role of Patient Preference. Thyroid. 2007 Feb. 17(2):157-60. [Medline]. Genovese BM, Noureldine SI, Gleeson EM, Tufano RP, Kandil E. What is the best definitive treatment for graves' disease? A systematic review of the existing literature. Ann Surg Oncol. 2013 Feb. 20(2):660-7. [Medline]. Pradeep PV, Agarwal A, Baxi M, Agarwal G, Gupta SK, Mishra SK. Safety and efficacy of surgical management of hyperthyroidism: 15-year experience from a tertiary care center in a developing country. World J Surg. 2007 Feb. 31(2):306-12; discussion 313. [Medline]. Panzer C, Beazley R, Braverman L. Rapid preoperative preparation for severe hyperthyroid Graves' disease. J Clin Endocrinol Metab. 2004 May. 89(5):2142-4. [Medline]. Piantanida E. Preoperative management in patients with Graves' disease. Gland Surg. 2017 Oct. 6 (5):476-81. [Medline]. [Full Text]. Erbil Y, Ozluk Y, Giris M, Salmaslioglu A, Issever H, Barbaros U. Effect of lugol solution on thyroid gland blood flow and microvessel density in the patients with Graves' disease. J Clin Endocrinol Metab. 2007 Jun. 92(6):2182-9. [Medline]. Randle RW, Bates MF, Long KL, Pitt SC, Schneider DF, Sippel RS. Impact of potassium iodide on thyroidectomy for Graves' disease: Implications for safety and operative difficulty. Surgery. 2018 Jan. 163 (1):68-72. [Medline]. [Full Text]. Calissendorff J, Falhammar H. Lugol's solution and other iodide preparations: perspectives and research directions in Graves' disease. Endocrine. 2017 Dec. 58 (3):467-73. [Medline]. [Full Text]. Zhang Y, Dong Z, Li J, Yang J, Yang W, Wang C. Comparison of endoscopic and conventional open thyroidectomy for Graves' disease: A meta-analysis. Int J Surg. 2017 Feb 22. 40:52-9. [Medline]. Alsuhaibani AH, Carter KD, Policeni B, Nerad JA. Effect of orbital bony decompression for Graves' orbitopathy on the volume of extraocular muscles. Br J Ophthalmol. 2011 Sep. 95(9):1255-8. [Medline]. Hiraiwa T, Ito M, Imagawa A, et al. High diagnostic value of a radioiodine uptake test with and without iodine restriction in Graves' disease and silent thyroiditis. Thyroid. 2004 Jul. 14(7):531-5. [Medline]. Anagnostis P, Adamidou F, Polyzos SA, Katergari S, Karathanasi E, Zouli C, et al. Predictors of long-term remission in patients with Graves' disease: a single center experience. Endocrine. 2013 Feb 11. [Medline]. Sato H, Sasaki N, Minamitani K, Minagawa M, Kazukawa I, Sugihara S, et al. Higher dose of methimazole causes frequent adverse effects in the management of Graves' disease in children and adolescents. J Pediatr Endocrinol Metab. 2012. 25(9-10):863-7. [Medline]. [Guideline] Ross DS, Burch HB, Cooper DS, et al. 2016 American Thyroid Association Guidelines for Diagnosis and Management of Hyperthyroidism and Other Causes of Thyrotoxicosis. Thyroid. 2016 Oct. 26 (10):1343-1421. [Medline]. [Full Text]. Rivkees SA, Stephenson K, Dinauer C. Adverse events associated with methimazole therapy of Graves' disease in children. Int J Pediatr Endocrinol. 2010. 2010:176970. [Medline]. [Full Text]. Mohlin E, Filipsson Nyström H, Eliasson M. Long-term prognosis after medical treatment of Graves' disease in a northern Swedish population 2000-2010. Eur J Endocrinol. 2014 Mar. 170 (3):419-27. [Medline]. Liu X, Shi B, Li H. Valuable predictive features of relapse of Graves' disease after antithyroid drug treatment. Ann Endocrinol (Paris). 2015 Oct 26. [Medline]. Villagelin D, Romaldini JH, Santos RB, Milkos AB, Ward LS. Outcomes in Relapsed Graves' Disease Patients Following Radioiodine or Prolonged Low Dose of Methimazole Treatment. Thyroid. 2015 Oct 20. [Medline]. Salvi M, Campi I. Medical Treatment of Graves' Orbitopathy. Horm Metab Res. 2015 Sep. 47 (10):779-88. [Medline]. Prasek K, Płazińska MT, Krolicki L. Diagnosis and treatment of Graves' disease with particular emphasis on appropriate techniques in nuclear medicine. General state of knowledge. Nucl Med Rev Cent East Eur. 2015. 18 (2):110-6. [Medline]. Jankauskiene J, Jarusaitiene D. The Influence of Juvenile Graves' Ophthalmopathy on Graves' Disease Course. J Ophthalmol. 2017. 2017:4853905. [Medline]. [Full Text]. Disclosure: Received research grant from: DepoMed and Bristol-Myer-Squibb. Fast Five Quiz: How Much Do You Know About Hyperthyroidism?